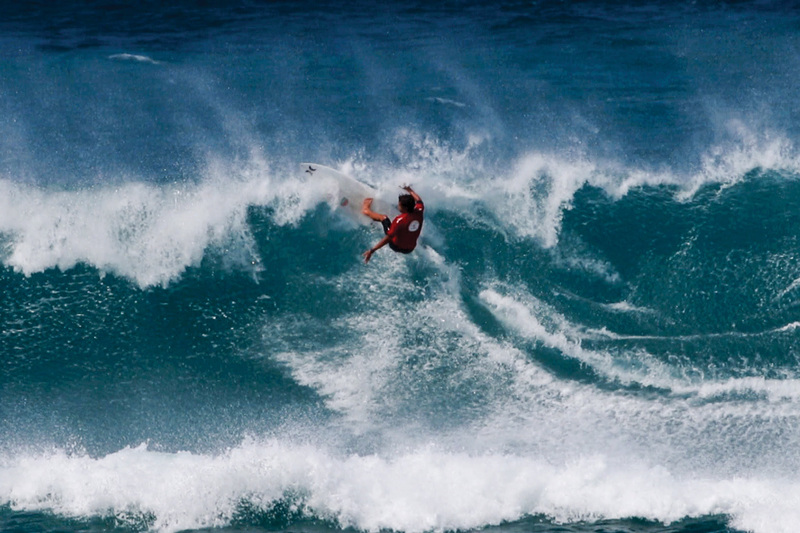 Shaun Burns (USA) in perfect position for the best barrel of the day, and his best wave ever at Sunset Beach. HALEIWA, North Shore, Oahu/Hawaii – (Thursday, January 18, 2018) — Santa Cruz surfer Shaun Burns (USA) scored the first barrel and best ride of the World Surf League Hawaii/Tahiti Nui’s 2018 competitive season at the Sunset Open, a Men’s Qualifying Series (QS) 1,000 event, after threading through a 10-foot tube and completing a swooping cutback turn on a beautiful set wave today at Sunset Beach. In Round 2 Heat 2, Burns went against decorated athlete Kai Lenny (HAW), Edrick Baldwin (HAW) and Tyler Newton (HAW) and found his excellent ride midway through the 24-minute heat after battling back and forth with Lenny on mid-range scores. Under the tutelage of seasoned pro Torrey Meister (HAW), Burns has traveled to the North Shore for the past two years and is using this event to gain valuable experience as he tallies up points on the professional tour. The wind was a challenging element today and athletes battled gusts of up to 30mph, but for waterman Kai Lenny, it felt like just another day on Maui, notorious for its wind-blown surf. Lenny is coming off of an epic free surf session at Pe‘ahi Sunday, where wave heights reached 50-feet and the world’s best big wave surfers set new standards. The 2018 Sunset Open marks one year since Lenny made his maiden appearance in a QS event. Last year, he advanced to the Sunset Open Semifinals and was ultimately ousted after an interference call cut his winning streak short. North Shore’s Kalani David (HAW) returned to competition after breaking his wrist in 2017 a day before the Vans World Cup, and went against World Champion and 6x Vans Triple Crown winner Sunny Garcia (HAW) today in the opening heat of Round 2. David opened up the heat with a 5.25 for an early lead however Garcia grabbed his two best rides – a 4.40 and 7.40 – to pull ahead and put the pressure on David. The other two competitors in the heat, Landon McNamara (HAW) and Shinpei Horiguchi (JPN) tallied a few rides but were unable to catch up to the frontrunners to advance. David ended with a 7.60 and 6.75 for the heat win. Aside from his wrist injury, in 2017 David underwent heart surgery after battling a rare genetic disorder that was uncovered during a life-threatening seizure. The athlete is stronger than ever now and proven to be incredibly resilient and motivated after competing in the 2017 HIC Pro and 2017 Hawaiian Pro. Contest organizers will reconvene tomorrow morning to determine the next call for competition by 7am HST. The swell is forecast to drop with a new pulse expected this weekend, which officials are targeting for the Men’s and Women’s Sunset Pro Junior. Another swell is on the horizon with improving conditions for Monday and Tuesday, which Surfline is calling a new/larger WNW-NW swell in the 5-10ft.+ range with light/variable winds.